NOTE: Deleting a link to an activity will remove the activity from your course. If the activity was a graded assignment, such as a Quiz or Upload File Assignment, its column of grades in the Gradebook will also be deleted. In the case of an Upload File Assignment, the students' uploaded documents will be deleted as well. 1. Log in to Moodle and open the desired Course. 2. Click the Edit button at the top right of the screen. 3. 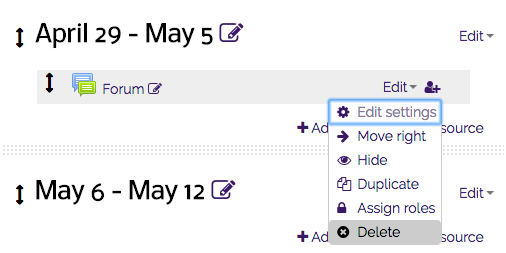 Select Edit next to the resources, and then click Delete in the dropdown menu. 4. A confirmation message should appear, click Yes to delete OR click No to cancel. 5. After clicking Yes, the item will be deleted from your Moodle Course. Note: An activity or resource can be retrieved from the recyle bin within eight days. To learn about retrieving items from the recycle bin, view Moodle 3: Administration Block: Recyle bin.